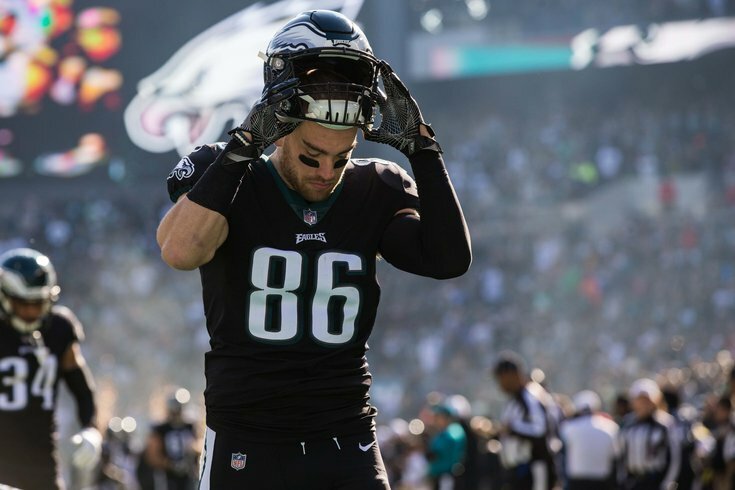 Philadelphia Eagles tight end Zach Ertz. There's not a whole lot going on in the NFL at the moment — although that will change in the coming weeks as we get closer to the 2019 NFL Draft — but that doesn't mean there's nothing to talk about when it comes to the Eagles. If we've learned anything over the years, it's that even with the Sixers about to start their postseason and the Phillies getting off to an impressive 4-1 start to their season, the Eagles talk simply does not stop around here. Earlier on Thursday, our own Jimmy Kempski wrote about the possibility of the Eagles trading for Brown running back Duke Johnson. He also hosted a chat and could barely get to half of the questions, if you need any more proof that people are craving Eagles content. Over at ESPN, Mike Sando posed a simple question to a handful of NFL coaches and executives at the NFL's annual meetings in Arizona last week: With Gronk retiring, who is the best tight end in the NFL? And it was no surprise to hear Zach Ertz's name mentioned. It was a bit of a surprise, however, to see Dallas Goedert's name pop up. With top decision-makers gathering for the recent league meetings in Arizona, I asked four head coaches and four personnel evaluators to name the NFL's best tight end now that Gronk is vacating his throne. They were unanimous in their answer -- and in their belief that no current tight end approaches Gronkowski for all-around excellence. In his rookie season, Goedert caught 33 passes for 334 yards and four touchdowns. That's not too shabby considering he was playing second fiddle to Ertz, whereas the other guys listed are more or less the No. 1 tight end on their respective teams. The Eagles haven’t drafted a running back in the first round since 1986 (Keith Byars), but that could change this season with Alabama's Josh Jacobs being a possibility at 25th overall. According to NFL reporter Adam Caplan, Josh Jacobs is expected to be in Philadelphia for a visit next week. While this certainly doesn’t mean the Eagles are going to draft Jacobs, they do get just 30 official pre-draft visits and they’re using one on the one running back who might be a first-round pick later this month. Jacobs is considered to be the top running back in this class by most and has been a trendy mock draft selection for the Eagles at No. 25. But would the Eagles really take him in the first round? If the Eagles decide to go defense with the 25th pick, they could look to pick up the next Fletcher Cox. I highly recommend checking out the highlights of Simmons that Lawlor has in his post, as well as much more info on why a guy like Simmons could fall to the Birds at 25. One of the best developments during the Eagles 2018 season was rookie Avonte Maddox, who was thrown into the fire as the Eagles secondary was decimated with injuries. Maddox earned a defensive grade of 65.4 in his rookie year (not including playoffs), ranking 10th out of 23 qualifying rookie cornerbacks. Although his grade was just a bit above average among rookie cornerbacks, he still had some very impressive coverage stats. Maddox played 391 coverage snaps and allowed just 218 yards, which equals out to only 0.56 yards allowed per cover snap – second out of 132 qualifying cornerbacks. In addition, Maddox allowed a passer rating of just 59.9 when targeted, also ranking fourth at the position. Impressively, Maddox saw only 33 targets last season. On average, he was targeted once every 11.8 coverage snaps, making him the most avoided rookie corner in the league in 2018. Including all cornerbacks in the NFL, only one cornerback was targeted less often than Maddox, and that person is Richard Sherman. Over at BGN, Michael Kist broke down the 10 most improbable touchdown passes in Carson Wentz's career (based on completion probability.) The craziest part might not be any individual play, but the fact that each of his five toughest completions went for touchdowns. You'll have to click over to see what the No. 1 play was, but here's a look at No. 2, which is from their 2017 Super Bowl campaign.